One of the hottest trends in the digital age across industries is the growing complexity of regulation. 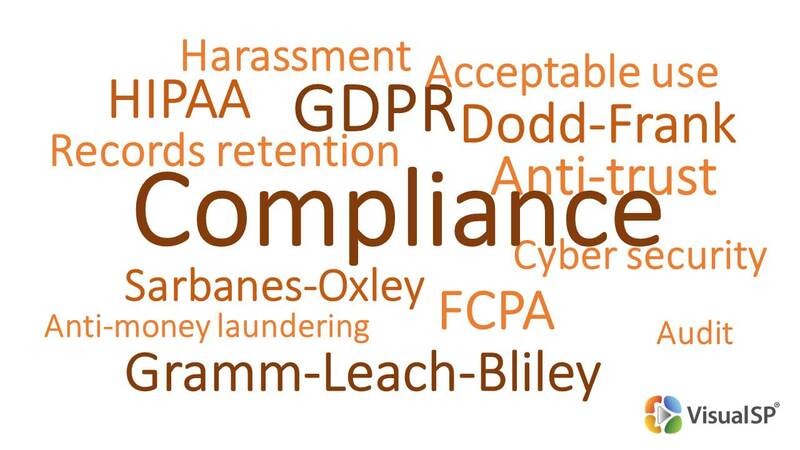 Whether the topic is online privacy, harassment, record retention, sanctions compliance, anti-trust, anti-money-laundering, or a host of other areas – organizations must continually revise policies and educate their users to understand the relevant laws and policies so they can make the right day to day business decisions. Recently $19.5 million dollars a fine was issued to a Canadian company for several GDPR breaches. Facebook is potentially facing fines up to $1.6 billion for recent GDPR privacy violations. Volkswagen’s Compliance Officer was personally given a $400k fine and 7 years in prison for the company’s compliance violations. Regardless of how brilliant your organization’s ideas, how innovative its technology, or how solid the business plan – this regulatory compliance trend could potentially determine the eventual success or failure of your organization. This is a challenge that some organizations navigate more successfully than others. Do Any Of These Archaic Training Methods Sound Familiar? An intranet site where your compliance team published policies as 127-page PDF files. Remote refresher course calls where everyone who says “present” is considered trained. A yearly cadence for recurring employee certifications that swallows hours every time it recurs. Compliance is not an Option. It's Mandatory and it’s the Law. 12% of organizations have an advanced compliance and ethics training program, but 40% of organizations rate their programs as basic or reactive. To effectively minimize poor employee decisions that lead to regulatory problems, some organizations are looking for ways to supplement or even replace traditional, formal compliance training programs. They're looking for more ubiquitous and real-time methods, such as context driven help, to make both technology and policy adaptable. One popular study suggested that adults learn as little as 10% from formal training, with the other 90% coming from informal methods and hands-on work. This means that delivering formal onboarding and periodic refresher training courses to your employees will only drive limited benefits in their performance, especially in a complex regulatory environment. As an example, employees frequently struggle with how compliance issues their decision about where they store documents. You likely have a detailed policy about this and a mandatory training course that employees complete every year. However, is the average employee able to apply the nuances of that policy to the scores of daily working decisions they must make? Is this file appropriate for a cloud repository, or should it stay within our network? What qualifies as ‘patient information’ in this context? What varies based on the topic and their role? Is this file appropriate to share with external recipients? Does this file meet the criteria for a business record? What am I supposed to do differently if it does? How confident are you that your organization is doing all it can to ensure your employees can make the right decisions every day? How effective is your compliance training program? To effectively minimize poor employee decisions that lead to regulatory problems, some organizations are looking for ways to supplement or even replace their formal compliance training programs with ubiquitous in-context help systems. These provide real-life guidance across a wide variety of systems, closing the gap between compliance training and compliance know-how. 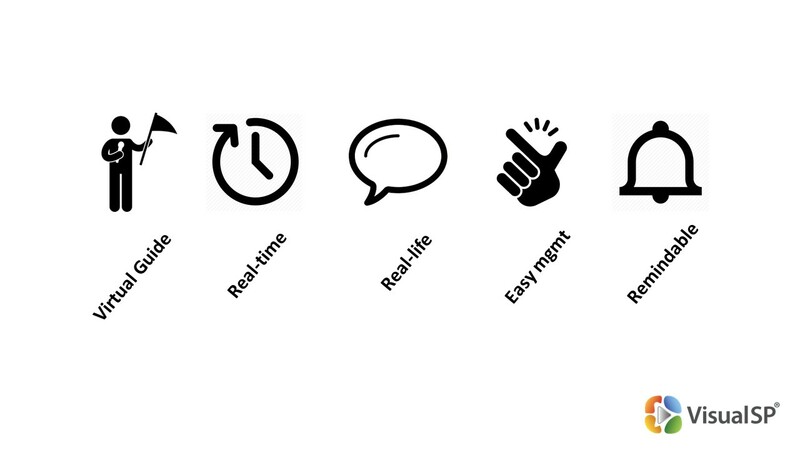 In-context help systems offer a level of relevance and convenience that is a game changer. While an LMS might host a training course, remind employees when it’s time to recertify, and track those results – it also requires every employee to devote time to long-form training and then remember the details for months, even for seldom-used elements. In contrast, a contextual system allows you to deliver guidance and real-life answers to common questions while the employee is actively working within the document and online tools. Delivering compliance help items to your employees in real-time with a click or two enables you to close the gap between compliance policies and actual compliance. The employee doesn’t have to find an online course or scroll through a lengthy published policy PDF looking for a specific answer. The result is employees that do less guesswork, make better decisions, and risk fewer regulatory disasters. For more than a decade, VisualSP has provided a market-leading tool for delivering real help to employees. We’ve also amassed considerable expertise in adoption strategies from the technology world. That expertise can now be directly applied to policy adoption and the challenges it entails. This is not theoretical – it’s a known commodity. We can help amplify your regulatory expertise when and where your employees need it, with minimal effort and optimal results. Join our resident user adoption coach and trainer Eric Eaton to learn how strategies and lessons learned can help you with your policy adoption efforts and challenges. Discover what a modern, effective online training program looks like? Learn how VisualSP can enhance your document management solutions with greater user adoption, tighter compliance, and better employee training. Don’t waste a minute, start your journey toward greater compliance and user adoption of your business critical solutions today.